CONTEST NOW CLOSED. The winner of the AG-2 Grips Signed by Aaron Gwin are Pinkbike users kovacika lpcouture cron Paraicj rrussell47 Eckster50 griffsterb montagnier26 Chuck79 dnickr Mquinney MarcoC bobjay marting1111 SammiSnail jlbob Dre23 BENAYA777 svandermaat switzb15. Our initial partnership with Aaron Gwin produced numerous innovations that pushed grip technology to new levels. With the new AG2 Grips, we wanted to continue to push the limit even further. 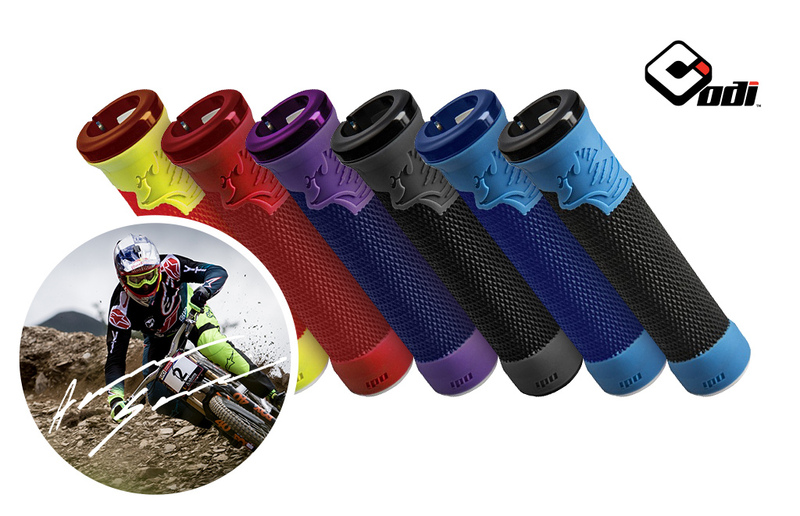 The AG2 grips feature an ultra soft “Pro Compound” material with an improved knurl pattern that provides extra tackiness and control along with reduced vibration transfer. We coupled these features with an offset grip pattern to allow more padding where it is needed most without creating a large bulky grip. We then redesigned the most impact prone portions of the grips to provide an even better feel and accurate control when riding. The result is the most aggressive mix of traction and comfort of any DH grip available. • New! Larger Diameter - Grips feature a larger diameter than the original grips (30.5mm) with offset padding towards the rider for improved comfort. • New! Softer Compound - Soft Pro Compound provides excellent shock absorption. • New! Surface Pattern - Redesigned surface pattern for improved traction and vibration dampening. • New! Improved Ergonomics - Redesigned Ends provide an improved feel. • Aluminum Reinforced Ends - Provide extra durability against grip blowout. • Angled Rib Pattern - Thin ribs add control without a bulky feel. • Single Clamp - Uses our race-proven Version 2.1 Lock-On system. • Hard Plastic End - Molded over the aluminum en-dcap, the end provides durability but will not gouge. MSRP: $35 each - 20 sets to be won by 20 different Pinkbike users!! How did Aaron sign these things? What pen allows the feat of scripture that is signing a thin rubber cylinder? Is the grip rotating as he signs? This is preoccupying. Probably signed the cardboard backing of the packaging I would imagine. @Patrick9-32: correct. my set are hanging up in my bicycle shrine in the garage ! I think I might have misunderstood. Waaaaaay back in the day, ODI made signature mushroom grips for some of the BMX heroes of the time. They actually had the signature molded onto the grip. Pretty cool, really. Yay increased diameter! Plus they look cool, and they're free, and... for all those complaining about color or size or whatever... don't enter... thank you for the increased odds. I was thinking about whether to enter. I do want my grips to be increased diameter. Might just buy a pair of these for my own sake. I actually won these last year, but when they arrived they weren't signed. Not even on the cardboard packaging. Don't be surprised if 'signed' grips actually means signature grips. Not that i'm complaining. They are great grips and look great on my wife's bike. Why would you want a surface pattern that makes itself wet when it vibrates? The wait for "Redshift ' is gripping. You have to hand it to him, he has a good hold on being PB's #1 Chirstmas caroler. Won't these dislocate my thumb? I bought a calendar last year and I never got it. I'm not sure who at pinkbike to contact with regards to this. You guys don't seem to have any customer service links. If you can wait til 31 December I'm sure someone can give you their old one. I didn't know it was possible to make grips that are fugly. I was wrong. Larger diameter and an angled rib pattern. 20 pairs, $35 a pair.